A cross survey view provides a means of querying similar questions across multiple surveys. Read this guide for examples and steps for creating cross survey views. A Cross Survey View provides a means of querying similar questions across multiple surveys. For example, an organization has fielded four surveys over the past year, covering four different topics. All of the surveys, however, asked participants for their age. It is desired to get a broad overview of the ages of everyone who has responded to the surveys. To do this, a cross survey view can be created with a question called AGE, and then “map” the AGE question on the virtual survey to the questions about age on each of the four surveys fielded. When a cross survey variable is mapped to a question on an actual survey, it is telling Illume to include results from that question whenever with every query on that variable. 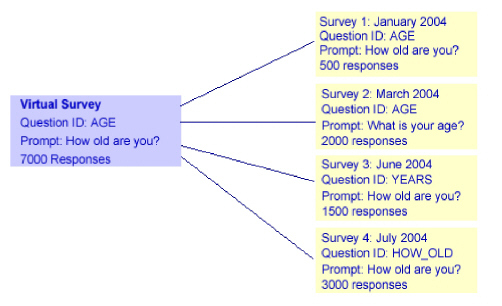 In the diagram below, the cross survey question AGE is mapped to four questions on four different surveys. Once this cross survey view is saved, it will appear in the list of Cross Survey Views in the Data Manager, and can be queried just like any other survey. Note that when mapping cross survey variables, differences in question prompts and ids do not matter. All that matters is that the questions share the same general data type. That is, all the questions to which a variable maps must be numeric; or they must all be true/false; or they must all be text questions. Illume prevents mixing data types because it is impossible to construct meaningful and reliable queries against inconsistent data types. Like normal surveys, cross survey views belong to projects. They are listed under the Cross Survey Views tab of the project page of the project to which they belong. The Cross Survey Views list contains all of the cross survey views in the current project. You can edit only those cross survey views that you created. These surveys have the Edit link next to their names in the list of Cross Survey Views. Create and name the new cross survey view. Add a survey to the view. Add any number of variables from the survey. Repeat steps 2 and 3 until the cross survey view includes all of the questions from all of the surveys to query. Enable the virtual survey, marking it as “shared” to allow others to query it. Cross survey views appear and behave just like actual surveys in the Data Manager. However, they have a few qualities that distinguish them from actual surveys. Cross survey views have an owner. Whoever creates the cross survey view owns it and, unless this person checks the shared option on the cross survey view page, no one else can query the view. The view owner is the only person who can edit it (i.e., add, remove, or change the variables). Cross survey views exist in draft form until they are enabled. It is possible to add, remove, and edit items on the draft copy of a view. But until enabled, no one else can see it or query it. A cross survey view becomes available for querying as soon as it is enabled. Note that, for cross survey views, enabling simply means making the view available for querying. Enabling does not make the view available to participants or the general public. Cross survey views cannot be manipulated with the Survey Designer. They exist only in the Data Manager to provide a means for querying data across multiple surveys. Cross survey views can be edited, re-published, and deleted. Deleting a cross survey view does not affect the underlying data belonging to the component surveys. Nothing done on a cross survey view can alter the data belonging to the component surveys. Click the Cross Survey Views tab on the project page. Type a name and optional description for the cross survey view, then click OK.
Go to the project that contains the view. Click the Cross Survey Views tab. Click the Edit link next to the name of the view you want to edit. Only the creator of the cross survey view can edit it, users cannot edit cross survey views created by others. Click the Add Survey icon to add a survey to the view. From the list on the left, choose the project containing the survey to add. From the list on the right, choose the survey to add to the view. Follow the steps for adding a question below. When adding a new survey to a cross survey view that already includes a set of questions, Illume will automatically match questions on the new survey to existing questions that have the same name and data type. Click the Add Question icon at the bottom of the survey column. This enables the adding of questions from the survey named at the top of the column. Choose one or more questions from the list of questions on this survey. Whenever possible, Illume will automatically map questions in a newly added survey to questions in the cross survey view. Illume does this by looking for survey questions whose name and data type match the name and data type of an item on the cross survey view. Click the name of the question you want to edit, or the edit question icon next to the name. If the question is not yet mapped, click the [Map] link. Choose the question you want to map. Note that the only questions listed are those whose data type matches the data type of the cross survey view question. The question selected now appears in the cross survey view. To remove a survey from a cross survey view, click the Delete Survey icon next the name of the survey to remove. To remove a question from a cross survey view, check the box to the left of the question name in the far left column of the cross survey view grid, then click the Delete Question icon at the top. To remove a question mapping, click the Delete Mapping icon to the right of the mapping you want to remove. Like survey questions, cross survey questions have a data type. A cross survey questions’s data type is the type of the first question mapped to the variable. If the first question mapped to the virtual survey variable is a Whole Number, then the cross survey question is a Whole Number. Once the variable’s data type is set, only other survey questions of the same data type can be mapped. There is a little bit of flexibility in this rule. All numeric types are considered to be simply numeric; the variable mappings do not distinguish between “Whole Numbers”, “Decimal Numbers”, and “Whole Numbers = 0″. Mappings also do not distinguish between Text type questions (short text) and commentary questions (long text). Both are considered to be simply text. The following table summarizes which type mappings are legal. Data can be limited in a cross survey view by adding filters. Click the Edit button in the Filters area. In the Cross Survey View Filter dialog, choose the variable to filter, choose an operator and a value. (Optional) Click Add Filter to add another filter, then repeat step 2. The new filter(s) appear at the top of the cross survey grid. The process for creating filters here is very similar to the process of creating query filters. Cross survey views may include filters to limit the data that show up when users run queries. This makes filters an effective means of segregating data. For example, assume a fielded survey called “My Survey,” that has collected 1000 responses. Data privacy rules may dictate that a restricted analyst in your organization can have access only to data submitted by certain participants: such as those over 18 who have explicitly opted in to a program. Let’s assume “My Survey” includes about 600 participants who meet these criteria. By creating a cross survey view called “My Survey View” containing all of the questions from “My Survey,” then adding the filters AGE >= 18 and OPT_IN = Yes. “My Survey View” effectively becomes a restricted view of the original survey, including results from only those 600 participants who meet the criteria. This view can now safely be shared with the restricted analyst described above. Simply enable the view and check the “shared” option so that others may see it. Click the Cross Survey View tab. Click Properties next to the name of the Cross Survey View. To edit properties from the Cross Survey View page, click the Properties button in the upper right corner of the page. Name – The name of the cross survey view. Description – A description of what the cross survey view contains. Parent Project -The project to which the view belongs. The cross survey view is listed on the project page of itsparent project. If the view is shared, anyone with access to the parent project has access to the view. There may be times to move a view into another project because someone who only has access to the other project wants access to the cross survey view. Shared – Cross survey views are private by default, meaning that only the person who created the view can see it and query it. Checking the Shared option, makes the view available to others for querying. Whether the view is shared or not, only the creator can edit the surveys and questions that make up the view. Edit these as necessary and click OK to save the changes. A cross survey view must be enabled before it can be queried. To enable a cross survey view, click the Enable for Querying button at the top of the cross survey view edit page. Cross survey views are private by default. That is, only the user who created the view can see, edit, or query it. This enables other users to query the most recently enabled version of the cross survey view. If the view is still being edited, other users will not see the edits until that version is enabled. Questions on a cross survey view have the same general properties as questions in a normal survey: a name, description, data type and scale. As with normal survey questions, these properties appear in the data dictionary and can be very useful to data analysts. page. This appears in the far left column of the cross survey view grid. This brings up the Cross Survey Item Details dialog, in which you can edit the question’s name, description and scale. When a cross survey question is created, its scale comes from the original question on the survey from which the question was added. For example, the cross survey view includes three surveys: Survey_1, Survey_2, and Survey_3. It also includes a question called AGE. If AGE was originally added to the view from Survey_1, the scale for AGE comes from the AGE question on Survey_1. If AGE was originally added from Survey_3, the scale for AGE comes from Survey_3. At times, the scales for a single question may differ across surveys. It may be desired for the cross survey view to use the scale from the third survey, rather than the first two, since the third scale includes more options. Click the edit icon to open the Cross Survey Item Details dialog. Under Scale, check the option Regenerate scale using values from survey. Choose the survey whose scale to use from the list. In some cases, several of the questions you have mapped to a cross survey question may have different scales. When this happens, it may be desireable to include all of the scale values from all of the scales. Under Scale, check the option Regenerate scale as a union of all survey scales. If the survey questions included in the cross survey view question have mismatched scales, there are two possible consequences. The first is relatively harmless and is easy to fix; the second may be harmful because it can lead to incorrect analysis of the data. By default, the scale for each question in the cross survey view comes from the first item mapped to the question. Let’s assume in this case that the GENDER question was first mapped from Survey_1. The scale, then, will include only the two values for male and female. When this cross survey view is queried, the results may include response values 1, 2, and 3 (since 3 was a valid response on Survey_3). Because 3 is not on the cross survey question’s scale, the Data Manager does not know what response 3 represents. The solution to this problem is to regenerate the scale for cross survey question as a union of all survey scales. This will ensure that any value found on the scale of any of the mapped questions appears in the scale. NOTE: When Illume creates a union of scales, the label for each scale item comes from the first question that includes the scale value. For example, if the label for value 2 is Female on Survey_1 and FEMALE on Survey_2, the label that ultimately appears in the data dictionary and on the summary results page will be Female (from Survey_1). If the scales of the questions on the cross survey view are in direct conflict, that is a problem that Illume cannot resolve, and the results of the cross survey queries will produce incorrect summary data. The cross survey will take the scale of the first question mapped as the scale for the cross survey question. This means that all responses with a value of 1 will be reported as Male in the summary results of a query on GENDER. All responses with a value of 2 will be reported as Female. This is obviously incorrect for anyone who submitted Survey_2. Even if there is a union of all scales, Illume has to pick one label for each of the scale values, and it picks the label from the first question mapped. That is, 1=Male and 2=Female. Again, Illume will report incorrect summary data for participants who submitted Survey_2. The only solution to this problem is to be consistent when designing surveys, and to avoid creating cross survey variables from questions that have conflicting scales. Illume’s repository was designed specifically to avoid the problem of conflicting scales by ensuring that repository questions are consistent from one survey to the next. This article contains detailed information about the restrictions that apply to mapping variables across surveys. It also points out the potential consequences of mapping variables with mismatched scales. Like survey questions, virtual survey variables have a data type. A cross survey variable’s data type is the type of the first question to which you map the variable. If the first question to which you map your cross survey variable is a Whole Number, then your cross survey variable is a Whole Number. Once the variable’s data type is set, you can map only to other survey questions of the same data type. When you create a cross survey variable, the variable’s scale is set to the scale of the first question to which you map the variable. For example, assume you create a cross survey variable called GENDER to collect gender information from Survey_A and Survey_B. If you map the cross survey variable to the gender question on Survey_A first, then the scale for the variable will have two values: Male (1) and Female (2). If you map it to the gender question on Survey_B first, the scale will have three values: Male (1), Female (2) and Other (3). In this case, it would be wise to map GENDER to the Survey_B question first, because that one has the broader scale. The following case represents a more problematic scenario. Assume again that we create a virtual survey variable called GENDER that maps to gender questions on Survey_C and Survey_D. These questions have mismatched scales, and mapping them to the same virtual survey variable is guaranteed to yield unreliable results. Again, the virtual survey variable uses the scale of the first item mapped as its own scale. If you map first to the question on Survey_C, the scale will be Male(1), Female(2). All of the “Female” responses from Survey_D are incorrectly represented as Male due to the mismatched scales. There is currently no solution or work-around to this issue. The best preventive measure is to ensure that question scales are consistent from survey to survey. Illume’s repository was designed specifically to enforce this kind of consistency. Repository questions include version numbers and strict controls to ensure they produce meaningful results when queried across surveys.